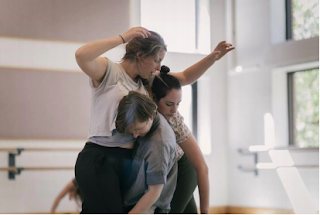 Independent choreographers Barbara Diewald, Leah Fournier, Madison Palffy and Jennifer Polins curate an informal performance series presented in partnership with the School for Contemporary Dance and Thought in downtown Northampton. WIP is a works-in-progress performance series curated by Barbara Diewald, Leah Fournier, Madison Palffy and Jennifer Polins, out of a shared priority to open dialogue between local and visiting artists, and to share dance works in the early stages of the creative process. Outside of the vibrant Five College Dance Department, there is little local support for choreographic inquiry, and this program supports the development of a vital performance art community for the valley. The informal Sunday afternoon series provides a low-tech forum for movement-based work by emerging and mid-career choreographers. WIP choreographers were selected by a rotating committee of peer artists and the 2017 roster includes award-winning dance makers from New York City, Cape Cod, Rhode Island, Portland, Maine, and the Pioneer Valley. WIP provides a forum to investigate ideas without the pressures or financial strains of production. Sharing developing work shifts emphasis to the creative act before the final product. The program is an incubator- a safe space where people come to work and share feedback with one another. WIP's vitality lies in its efforts to create an ethos of generosity, vulnerability and unknowing. Artists presenting their work in WIP in April 2017 are: Jessica Beliles, Meghan Carmichael, Sofia Engelman, Michelle Huber & Kelsey Hobbs, and Kelly Silliman/the tinydance project. WIP will take place at SCDT (The School for Contemporary Dance and Thought) at 25 Main Street in Northampton (Fourth Floor). Tickets are available at the door for $5, and are free for students currently enrolled in SCDT’s Youth Dance Program. Please direct all questions to Barbara Diewald at barbiescdt@gmail.com. Jessica Beliles is a recent graduate from Smith College where she studied dance and the study of women and gender. Recently, Jessica finished a summer as an artist in residence with the Art Monastery Project where she researched the intersections of dance, physical theater, and social activism. Her work has been shown at Smith College, Saint Johnsbury Vermont and, most recently, her living room. Sofia Engelman lives in Northampton, MA and studies at Smith College. She is interested in working closely with objects, making messes, improvisation, and going on short adventures "with" her alter ego. Her work has been presented at venues including the Bates Dance Festival, Institute of Contemporary Art/Boston, Harvard University, and Studio 408. In 2015, she created her first evening length dance work, Brunch, while in residence at Green Street Studios and the Denmark Arts Center. Recent performance credits include work by Sara Sweet Rabidoux, Lauren Simpson, Chris Aiken, Angie Hauser, and Whitney Wilson. Kelsey Hobbs is a mover, improviser and creative explorer from Albany, NY. She holds a Bachelor of Arts from Goucher College, where she studied Dance, French and International Relations, and is a graduate of the School for International Training (SIT) program in Senegal. She draws inspiration from the practice of Contact Improvisation, Body Mind Centering (BMC), Authentic Movement, Butoh, Grotowski Physical Theater, Feldenkrais, Axis Syllabus, music and the Earth. She now lives, works and creates at Earthdance in Western Massachusetts, where she is the Programming and Development Manager. Kelly Silliman is a dance artist and educator currently residing in Western Massachusetts. She is the director of the tinydance project, a collaborator with Deborah Goffe/Scapegoat Garden, and an independent dance teacher and choreographer. The tinydance project is a performance ensemble based in the Northampton, MA area that began with the question of what dance and performance art would look like without the high-tech resources currently available to us. Performances are presented in natural light to acoustic accompaniment on a 4’ by 8’ stage towed by bicycle to outdoor venues. Modeled after the values of Tiny Houses, which are highly designed for efficiency and beauty, the tinydance project presents multidisciplinary, movement-based performances with intricately woven and curated sound scores. Presenting work in this way is part of the company members’ practice and exploration of sustainability in art and life. Tinydance collaborators are always paid for their creative work, and maintain a commitment to presenting performances free to the public.